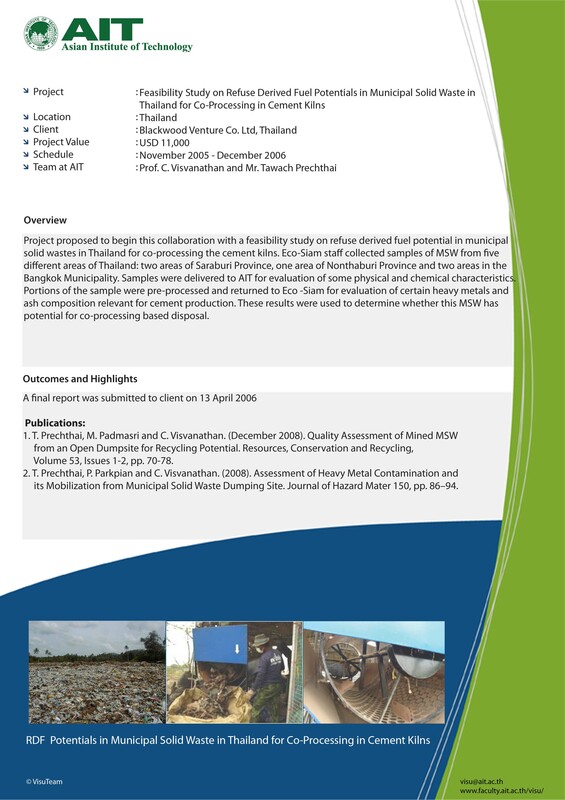 Characterization of Municipal Solid Waste in Phetchaburi Province, Thailand. 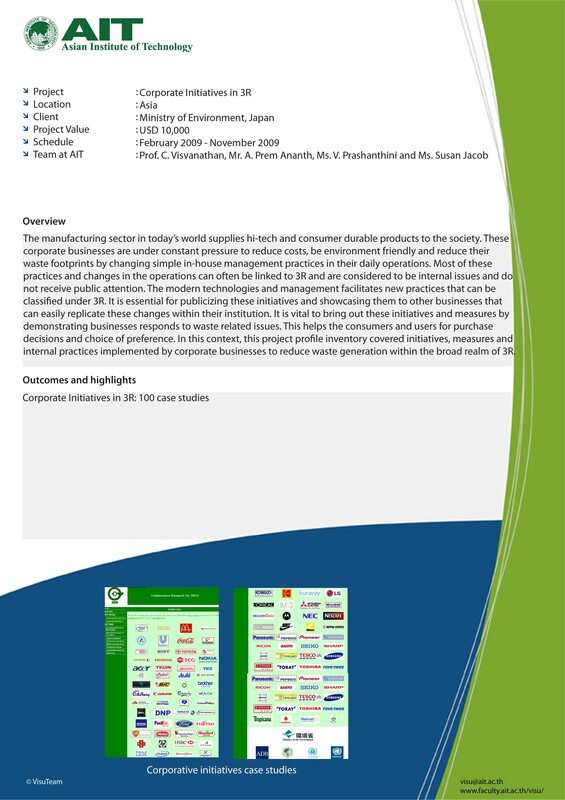 Small and Medium scale Industries, SMI in Asia. 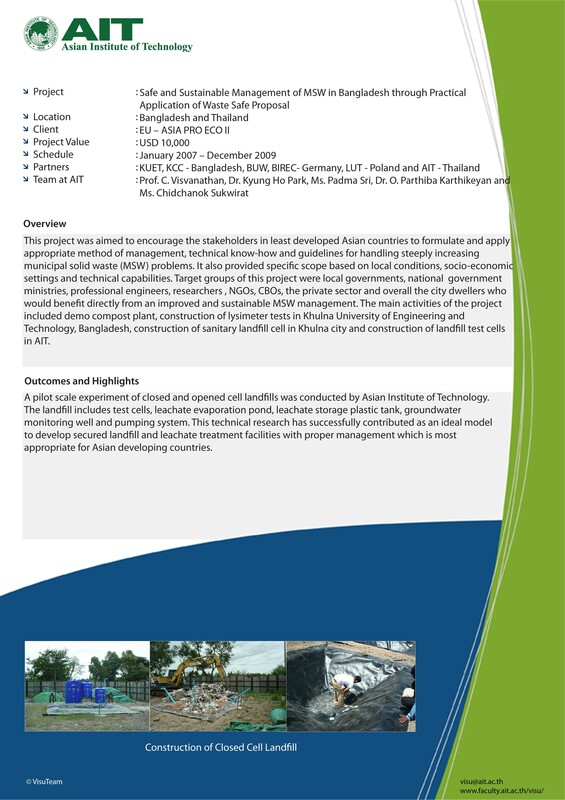 Treatment of high-strength organic wastewater using thermophilic-aerobic membrane bioreactor to investigate the feasibility of effluent reuse and Decentralized wastewater treatment and reclamation using membrane bioreactors – sponsored by SACWET (Southeast Asian Center for Water Environmental Technology). 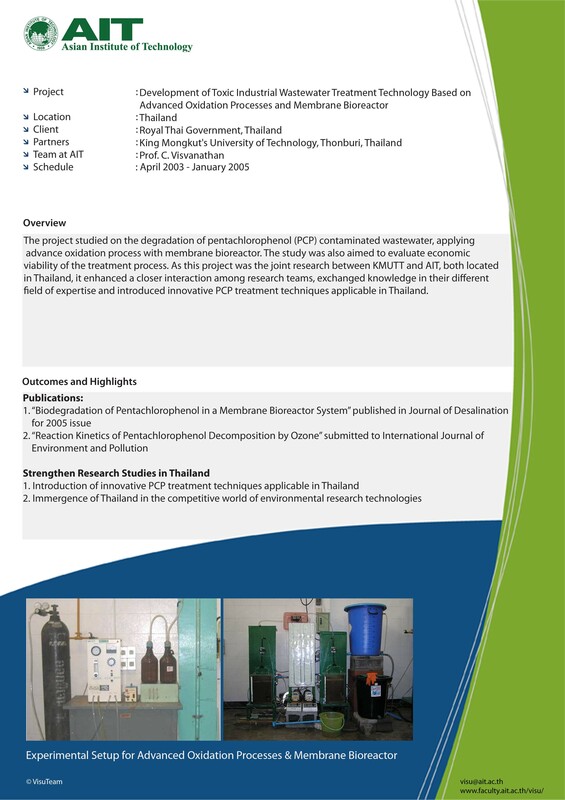 Development of Toxic Industrial Wastewater Treatment Technology based on: advanced oxidation processes & membrane bioreactor – sponsored by Royal Thai Government. 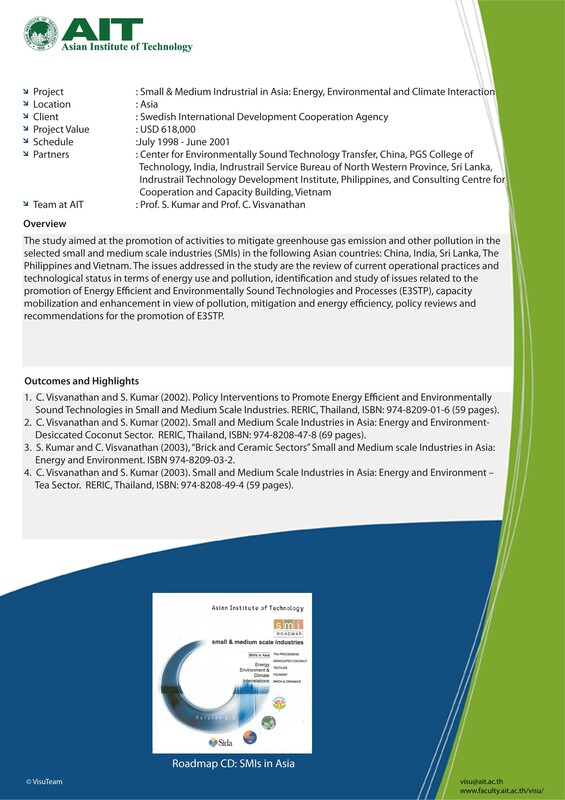 Feasibility Study of Eco-Industrial Clusters Located in Urban Rural Fringe Areas of India, Thailand and Vietnam funded by Institute for Global Environmental Strategies, Japan. 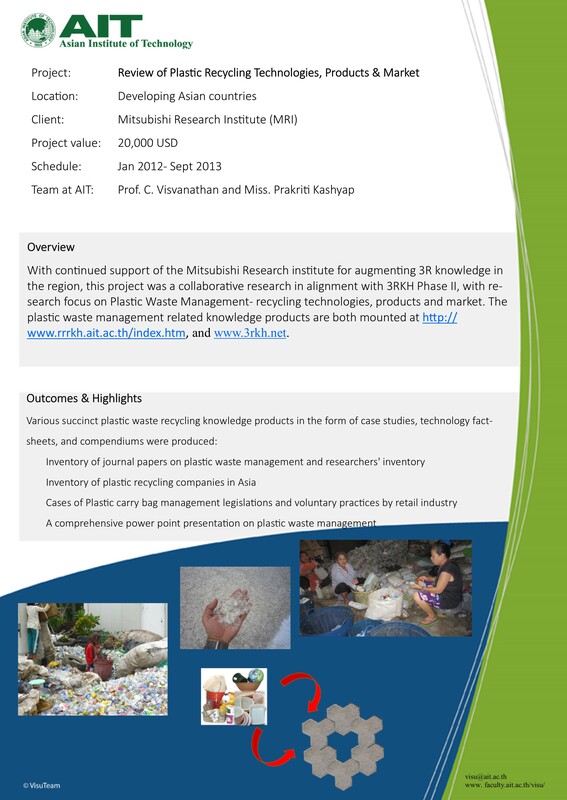 – funded by CIDA-AIT Southeast Asia Urban Environmental Management Applications (SEA-UEMA). 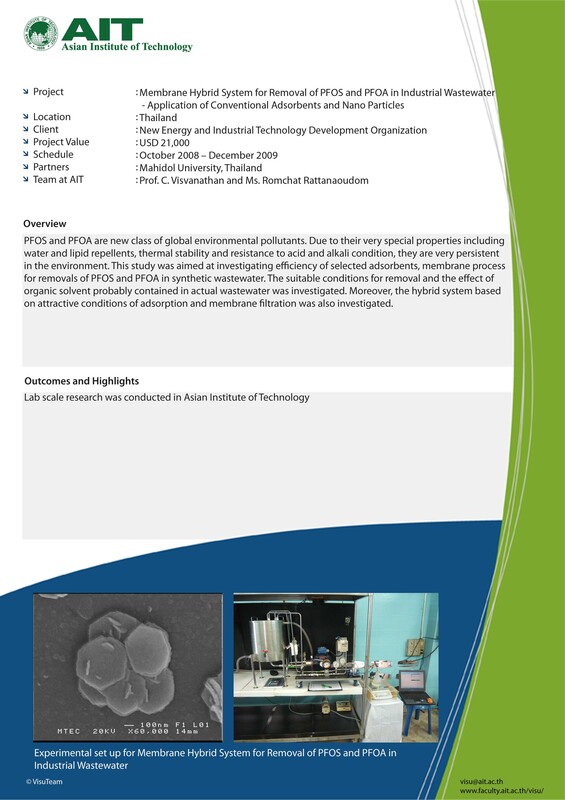 An integrated study on treatment of shrimp aquaculture wastewater based on membrane bioreactor and development of a membrane technology curriculum – sponsored by Royal Thai Government. 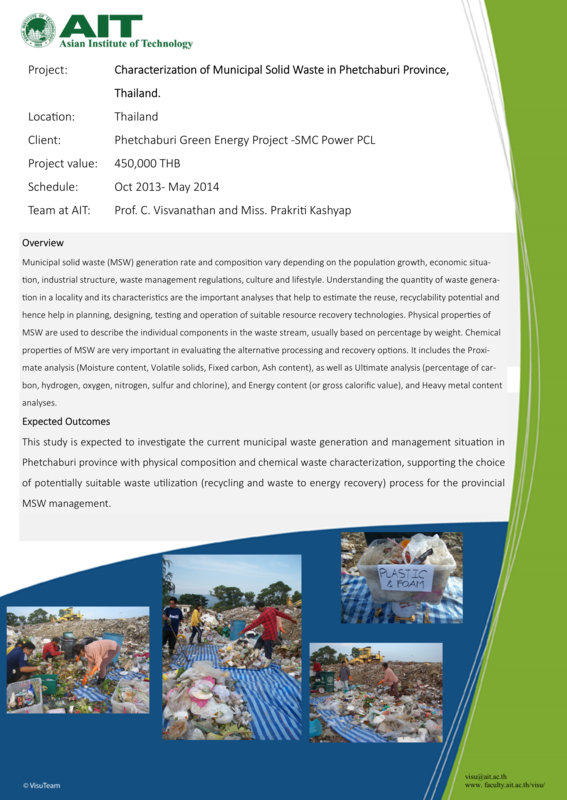 Feasibility study on refuse derived fuel potentials in municipal solid waste in Thailand for co-processing in cement kilns – sponsored by Blackwood Ventures (Thailand) Co., Ltd. The Fourth International Symposium on Southeast Asian Water Environment 4th SACWET Symposium, 6th – 8th December, 2006 – sponsored by The University of Tokyo Japan. 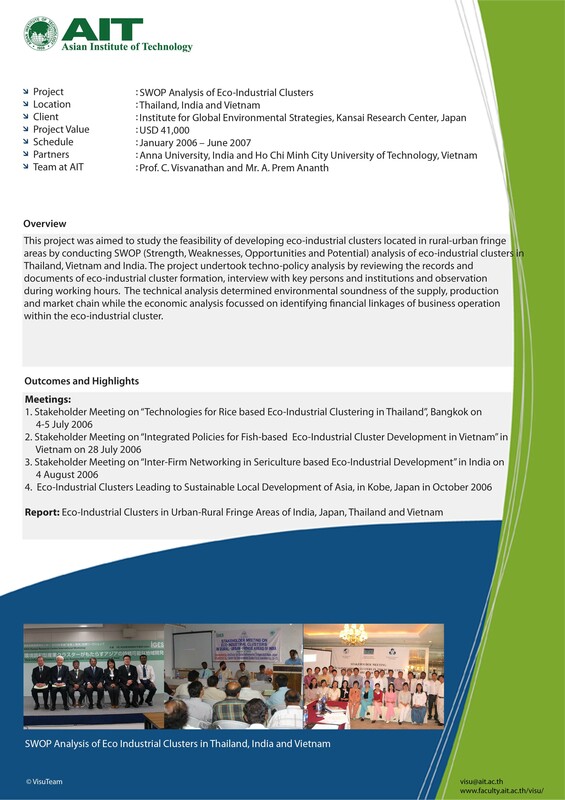 SWOP Analysis of Eco-Industrial Clusters in India, Japan, Thailand and Vietnam funded by Institute for Global Environmental Strategies, Japan. Feasibility Study of Eco-Industrial Clusters Located in Urban Rural Fringe Areas of China, Indonesia and Sri Lanka funded by Institute for Global Environmental Strategies, Japan. 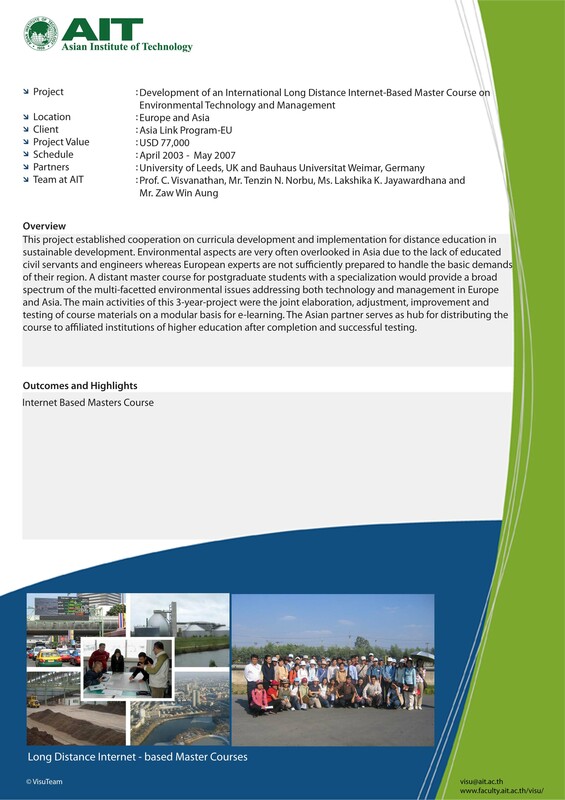 UNIDO Consultant, developed a Training Program on Curriculum Development in Cleaner Production for the National Universities, National Cleaner Production Centre Colombo, Sri Lanka (5-9 June 2006). 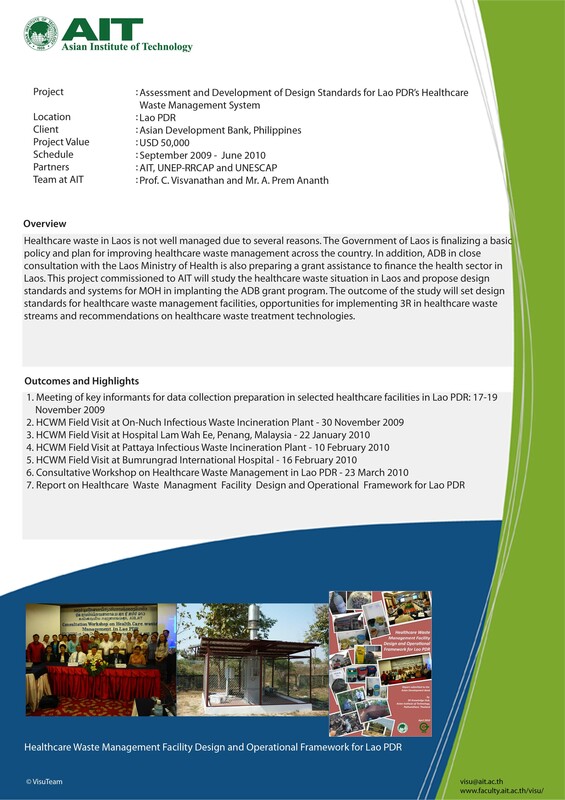 Cleaner Production Expert on the Role of Academic Institutions in Industrial Chemical Management: Cases of Asean Nation, UNIDO (December 2005). 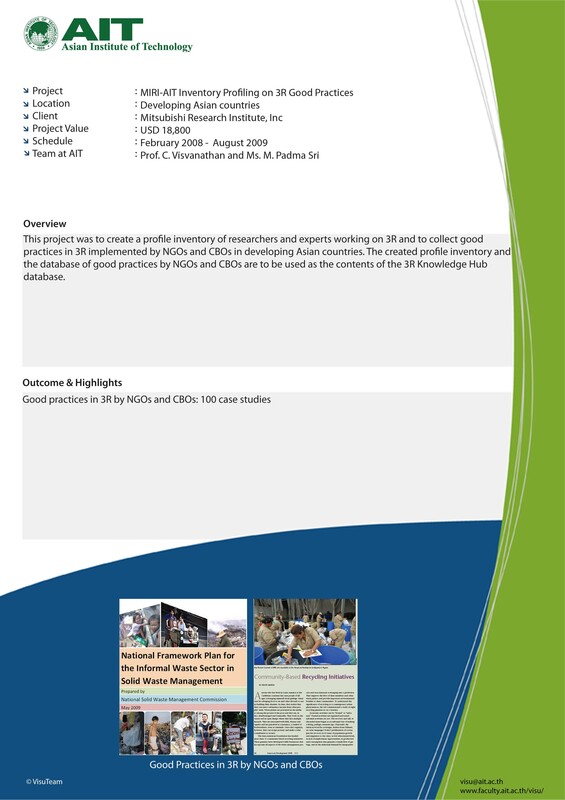 Cleaner Production Expert, helped in the compilation of status report on the existing Multilateral Environmental Agreements and their links to Cleaner Production, Centre in Ethiopia, UNIDO (June 2004). 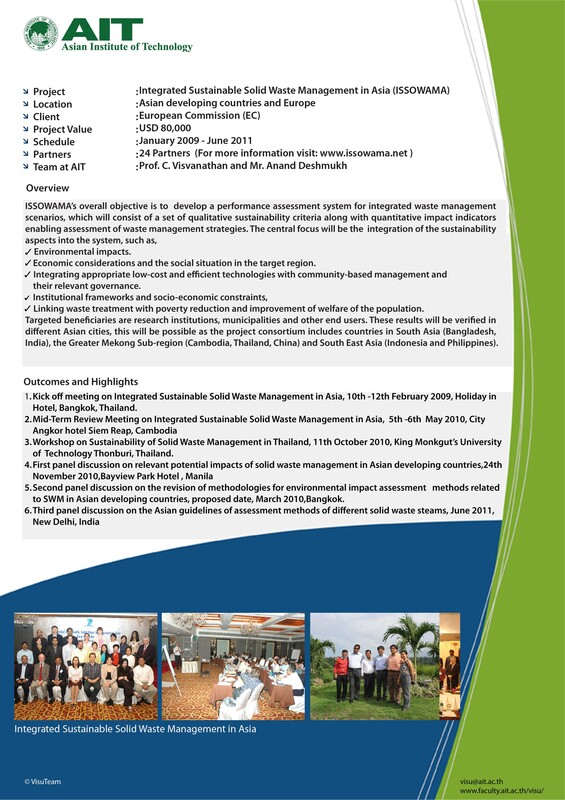 Environment Assessment Specialist on Environmental and Social Safeguards: Capacity Building Assessment and Strategy for the Mekong Region Countries, funded by World Bank (September 2002). 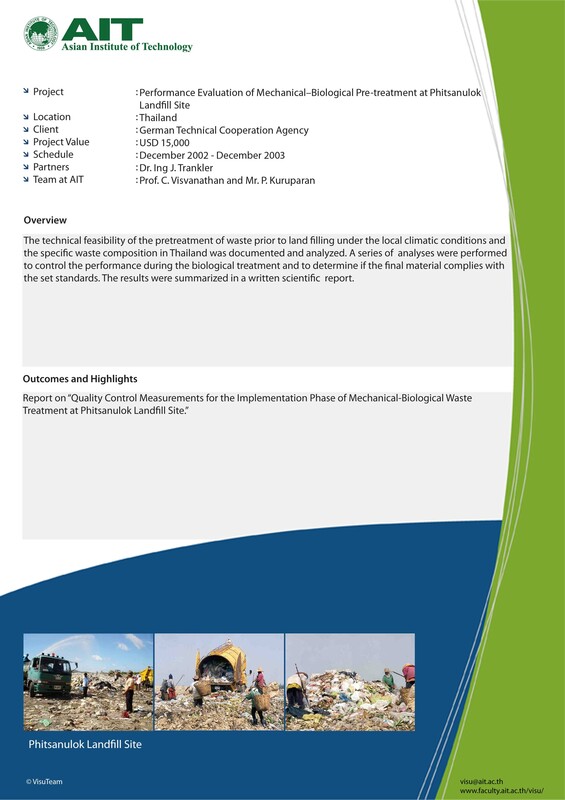 Waste Management and Cleaner Process Expert for UNIDO, Vienna, Austria, provided technical assistance for report writing on Municipal Solid Waste Management in Asia and Africa: A Comparative Analysis (November 2001). Cleaner Production Curricula Expert for UNIDO, provided assistance to Vietnam Cleaner Production Centre at Hanoi, incorporating cleaner production as part of the university curriculum (March 2000). 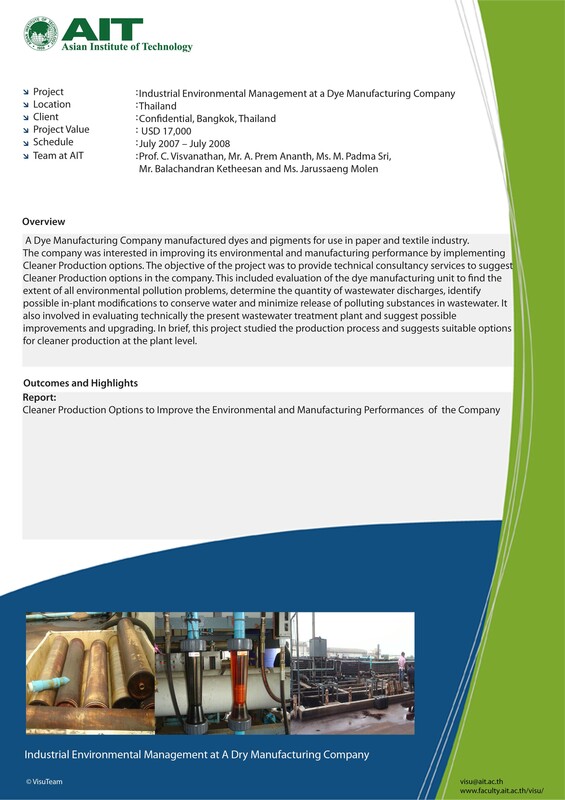 Preparation of Cleaner Production Technology Fact Sheets for Pulp and Paper Industries, UNEP (January 1998 – December 1998). Organized a Training Program on Environmental Appraisal of Industrial Projects for Officers of Sri Lankan Financial Institutions, AIT, Bangkok, Thailand, funded by KfW and National Development Bank of Sri Lanka (June 1998). 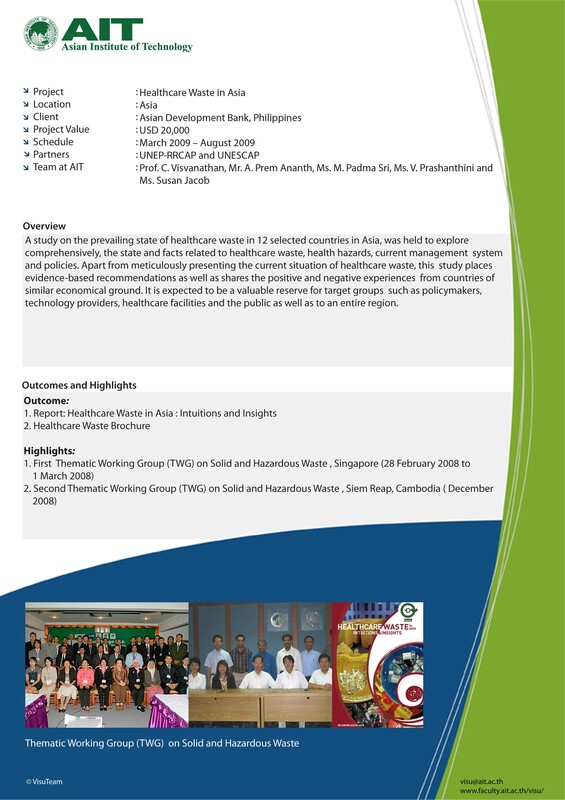 Preparation of Environmental Audit and Toxic Sludge Management Plan for THAINOX, Thailand (September 1997 – September 1998). Electroplating Sector Cleaner Production Expert Consultant for the Danish Cooperation for Environment and Development (DANCED) on the project Promotion of Cleaner Technology in Thai Industry, TEI (June 1997 – December 1997). 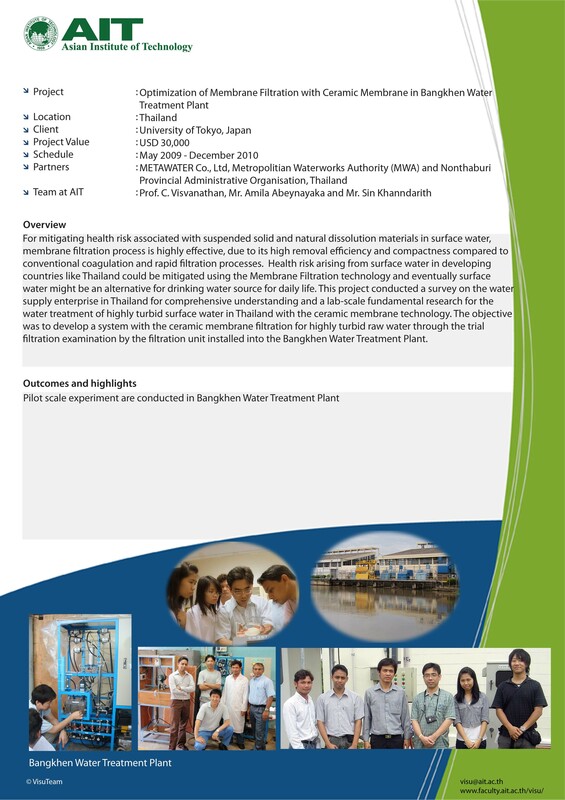 Treatment and Disposal of Mercury Contaminated Waste, TOTAL Exploration Thailand Ltd. (January 1997 – September 1997). 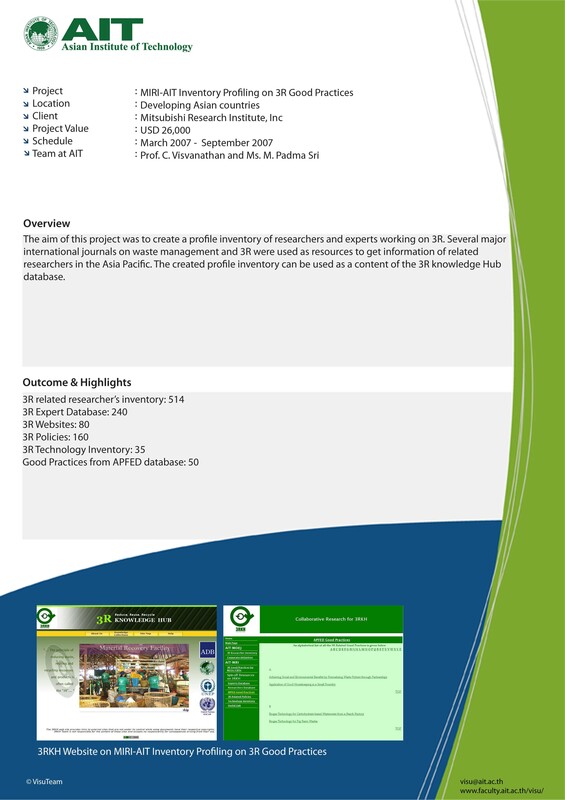 Development of Training Resource Package on Cleaner Production in Food Processing Industry – Poultry Slaughter House for UNEP Working Group in Food Processing (1997). 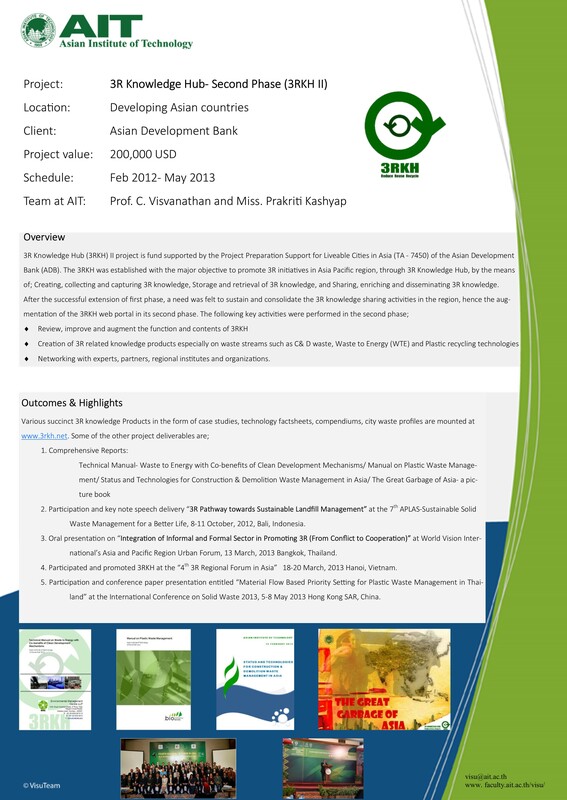 Development of Energy Efficient and Environmentally Sound Industrial Technologies in Asia, SAREC–Sida (1996 – 1997). 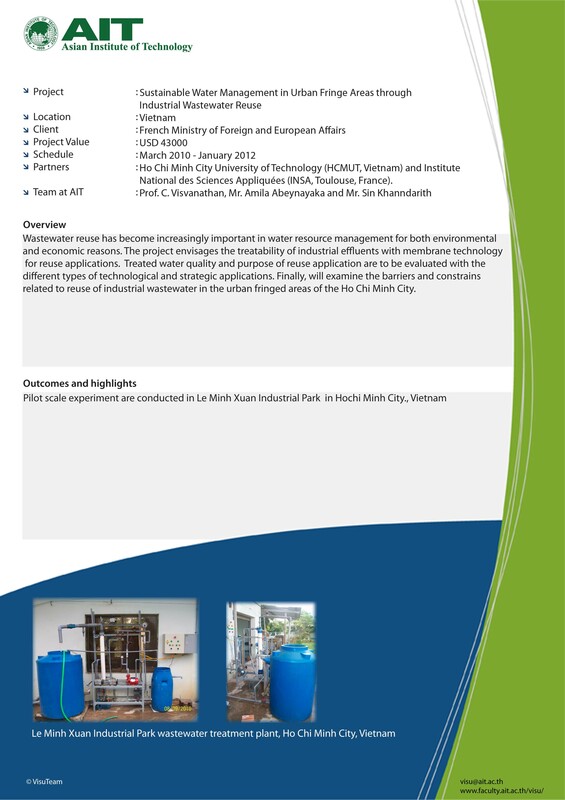 Organized a Training Program on Water Supply and Sewerage Master Plan, Part I: Water Supply for Bhutan Government, AIT, Bangkok, Thailand, funded by DANIDA and Carl Bro Int. – Denmark (April 1996). 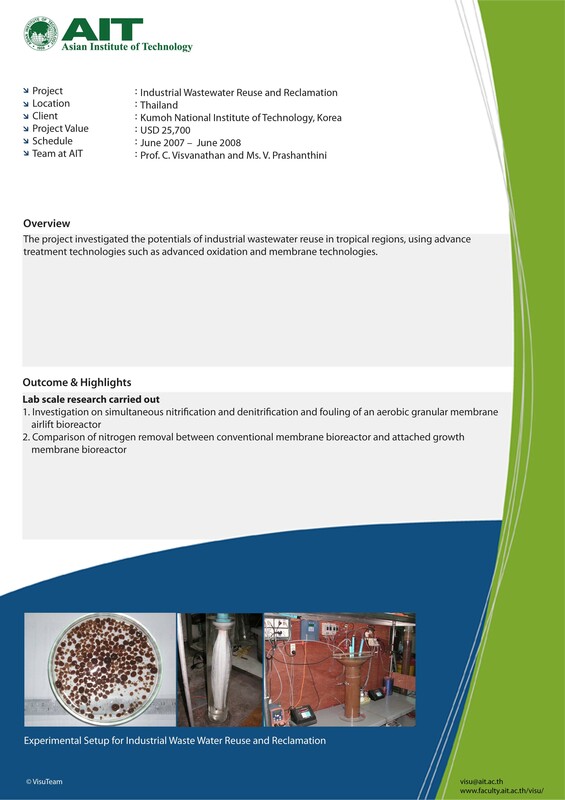 Spent Caustic Recovery Potential using Membrane Technology, Coca-Cola Factory, Bangkok, Thailand (January 1996 – August 1996). Water Quality Expert on the Royal Initiative Project on Water Resources Development for Metropolitan Water Authority, Bangkok, Thailand (May 1995 – April 1996). 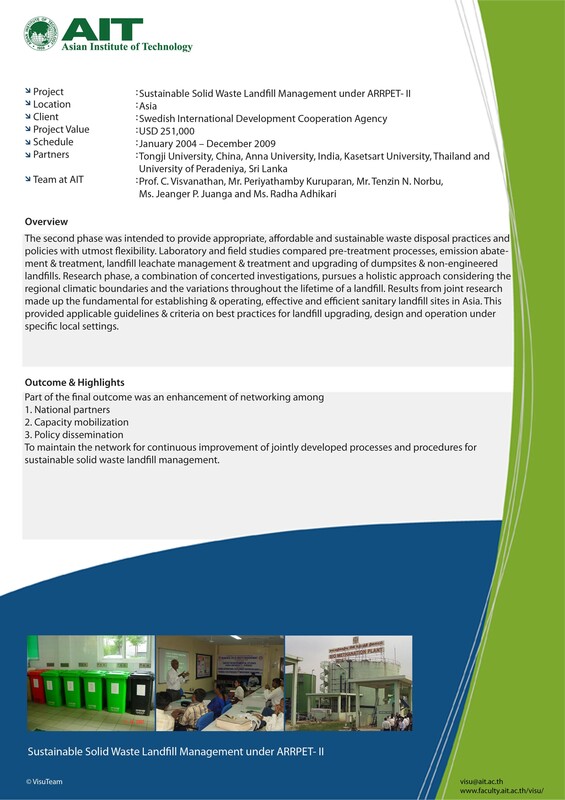 Demonstration Factory Project on Identifying Waste Minimization Options in Bangkok, Thailand, Asian Productivity Organization’s (APO)(September 1995 – September 1996). Organized a Training Program on Environmental Appraisal of Industrial Projects for Officers of Sri Lankan Financial Institutions, AIT, Bangkok, Thailand, funded by World Bank and National Development Bank of Sri Lanka (April 1995). Waste Auditing in an Ice Cream Factory – Lever Brothers, Thailand (September 1993 – April 1994). 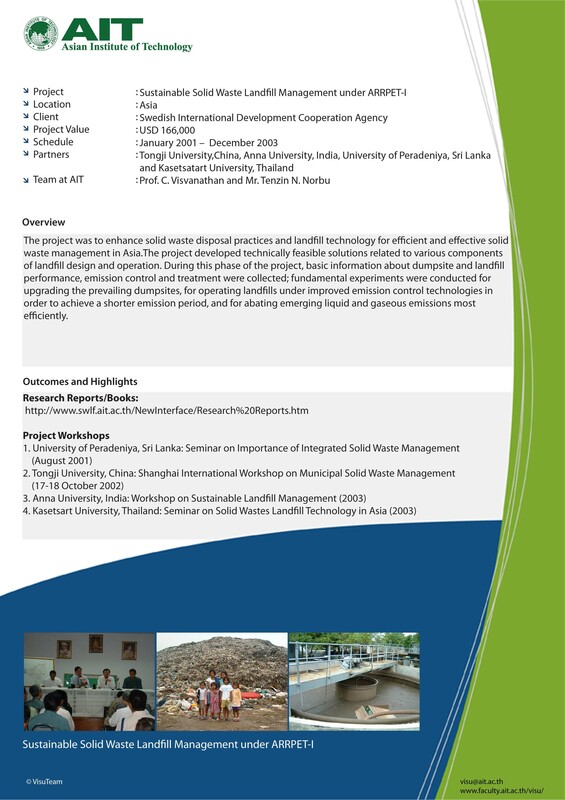 Associate Visiting Consultant for Colombo Metropolitan Environmental Improvement Program, funded by World Bank (October 1993 – March 1994). 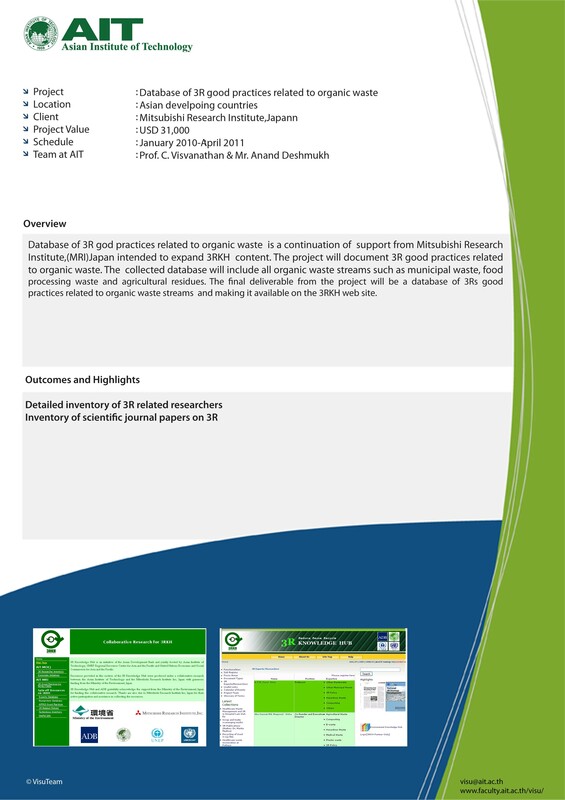 Waste Auditing in a Small Scale Dyeing Industry and Recovery of Dyes, CDG (May 1993 – November 1994). 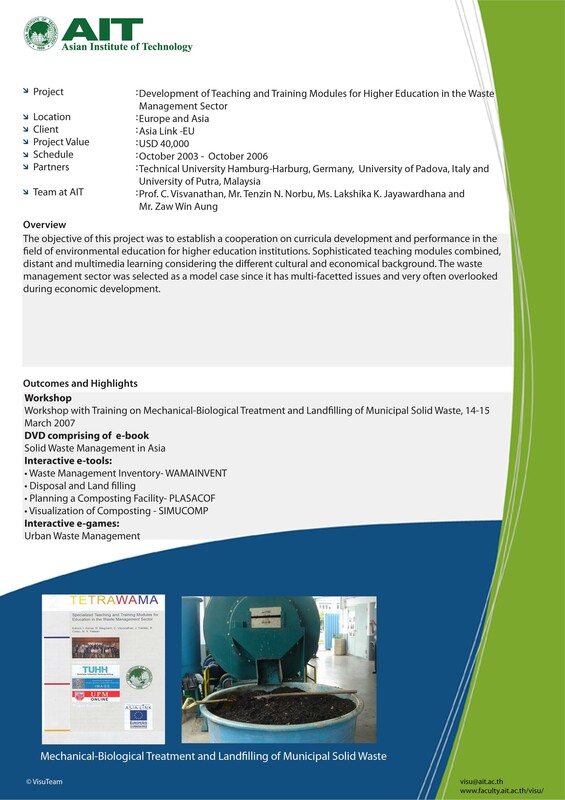 Feasibility Study for the Establishment of a Joint Wastewater Treatment Plant for Industrial Estate/Industries in Ekala and Ja-Ela, Metropolitan Environmental Improvement Program, Colombo, Sri Lanka, funded by World Bank and Soil and Water Ltd., Finland December 1993). Strategy Guidelines and Institutional Strengthening for Industrial Pollution Management, Metropolitan Environmental Improvement Program, Colombo, Sri Lanka, funded by World Bank and ERM London (August 1993). 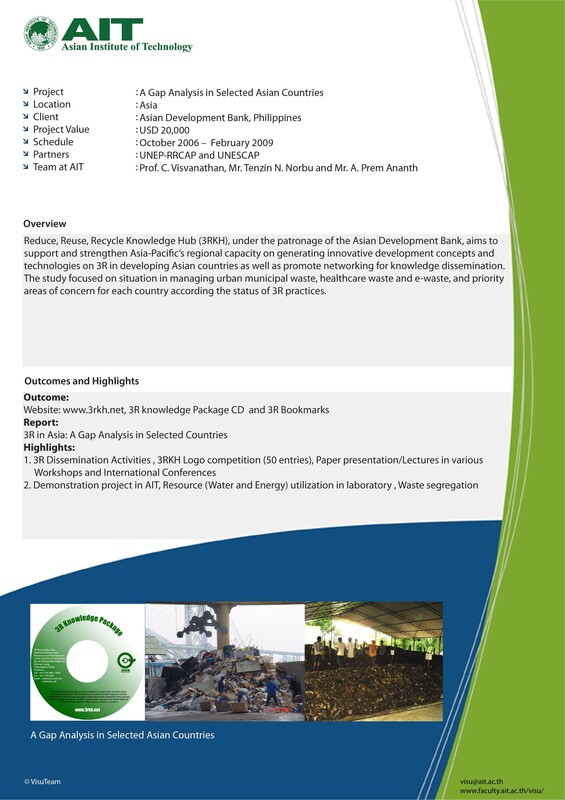 Setting-up of a Data Bank on Hazardous Waste Management for Asean and South Asian Countries, funded by the French Agency for Energy & Environment (ADEME)(September 1992). 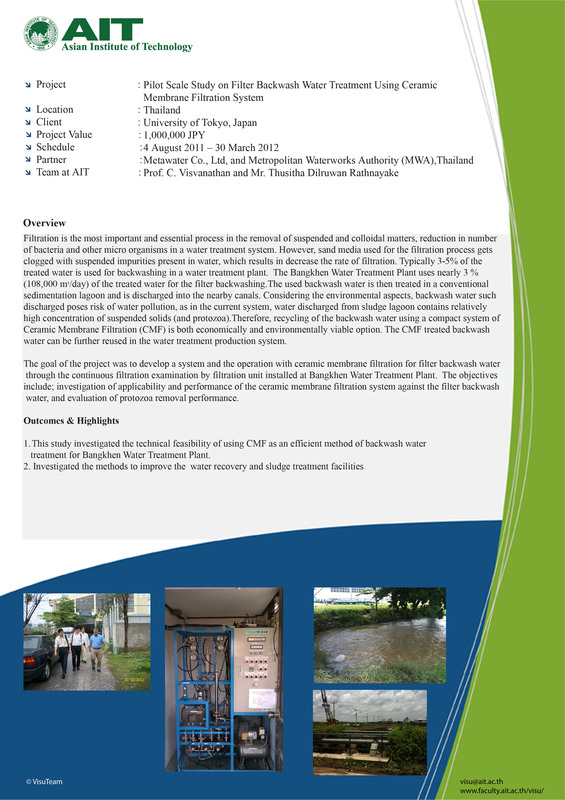 Selection of Appropriate Wastewater Treatment System for a Small Village on the Chao Phraya River Bank, funded by UNEP and CIDA (September 1992).